What is also interesting for me, as a non-religious visitor / listener / observer, is how one feels as an outsider, sometimes literally confined to the outside of the temple. In this scenario, I am uninitiated in the mysteries and rites of the religion, but yet participate in my own tourist rituals of visiting these ‚important religious sites of interest‘, and documenting them with numerous photographs or sound recordings. I am required to partake in rituals such as ‚remove your shoes and place them in the plastic carrier bag provided‘ to carry with me whilst visiting mosques in Istanbul. I exchange my Thai Baht for 108 satang to make offerings to the reclining Buddha in Wat Pho. I find myself asking to what extent do these acts really demonstrate reverence? Is there some irreverence in the manner that one ‚collects‘ religious sites? Religious sites and activities have historically been one of the most prominent contributors to the soundscapes of human habitation, and in a world that grows increasingly noisy these sounds often still prevail; though their reach may be somewhat limited or require amplification. Ironically, it is within the architecture of these same sites that one may seek relative silence, or certainly a hushed sanctuary when the tourists have subsided. And so this duality of the sacred and the profane, of prominent punctuation and muted quietude, inside and outside, came to influence my process of deciding what sounds to include in this collection and where, within each recording, to make the cut. Forms of religious worship, and the places where they take place-in are varied & sometimes unique- from the scared & mystical, to the arcane & timeless, onto the seemingly mundane yet still intriguing. “Sacred & Profane” finds British sound artists & composer Iain Armstrong offering up a collection of fifteen field recordings made in various religious sites around the world over a twelve year period. The just under 67 minute release finds Armstrong taking us on a fairly diverse, layered and rewarding sonic journey across various continents & many faiths- from small scared sites, to larger temples or churches. From crowded areas of worship, to more inmate & remote places. To give an idea of the scope & the content of each of the tracks, I’ll give you a run down of the first five tracks here- we move from the ornate yet sparsely haunting church bells tolling of St. Salvator’s in Casalbordino, Italy. Onto the human chatter & majestic pray chant of Sultan Ahmed Mosque in Istanbul, Turkey. Over to the aged & various bell/ gong tolling, water rushing & distant oriental people chatter/ pray of Chumig Gyatsa (one of the 24 Buddhist Tantric places) located in Mustang, Nepal. Though to the muffled people & child chatter, foot falls, boards creaking, cat meowing(!) & benching sitting of Beyazit Mosque Courtyard in Istanbul, Turkey. Onto the duck quacking, children crying, traffic drone, and distant regimented church bell ringing of St. Martin’s in Bowness-On-Windemere, England. The fifteen recordings last between just under the two minute mark, to just over the ten minute. And for the most part Armstrong mangers to select the perfect length for each of the tracks- so you get a good idea of each sites various sonic make-up & individual sound map, yet you never become bored or jaded, as he keeps the feeling of variation, setting & often wonder flowing from track to track. 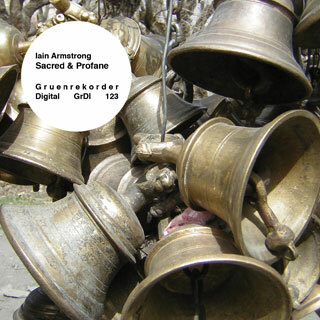 “Sacred & Profane” is another worthy chapter in the Gruen Digital series, with Armstrong taking the listener on a fairly wide-ranging journey through the various sounds & sonic imprints of these places of religious worship. Iain Armstrong is a composer and sound artist based in Birmingham, UK. His interest is focused on environmental sound recordings expressing themselves a particular music that Armstrong exposed for interpretation through listening, digital processing , composition and performance. His work includes soundscape, acousmatic and radiophonic composition, sound design for theatre and visual media, multichannel sound installation and electroacoustic performance. On ‚Sacred & Profane‘ the recordings span several years and several countries that were visited between 2000 and 2012 in sacred places of Italy, Turkey, Nepal, Germany, England, Indonesia and Thailand. All these sites are visited by thousands of tourists and in this act of recording and capturing ambient sound, Armstrong asked himself if there is irreverence of what he makes, hence the duality between the sacred and the profane, that influenced him for the editing process in this album. Several bell clangs, engine sounds on the street and people noises make up different cultures and languages are appreciated on this disc.